Trifextra Weekend Challenge: This weekend we’re asking for 30 of your own words plus the three following words for a total of 33 words. Even Spanish dogs know the word “walk”. Hahaha Sweet post, Joanne! I think they actually read your body language …amazing what they pick up on! It’s nice to be non-serious sometimes. Looking at him practically doing cartwheels to race me to the door, I can’t help but smile, no matter how dour I may be. Thanks, Bjorn. Our Cavie Teddy has a Blenheim kiss on the top of his head too. This is sweet and fun. Great use of the prompt words. 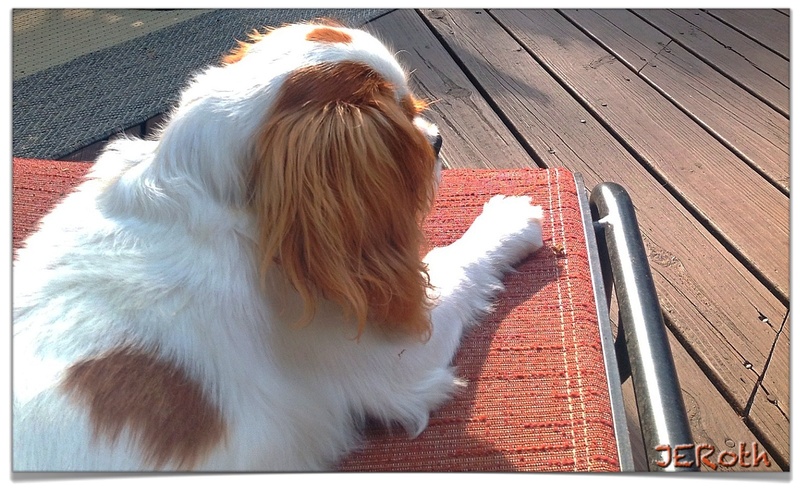 Thank you…I have tons of photos of him, but wanted to find one that showed off the Blenheim spot on his head. Yep…same here. My daughter has a golden and her exuberance is about 50 pounds more obvious than my Cavie. But that are so excited, to go for a walk, even though they both have huge fenced in yards to romp around in, untethered. Yet when we pick up the leash…well, you know. Thanks. Thanks, Draugh. The only problem I have with him is that every time I sit, he expects that my lap belongs to him! I’m not really complaining. Yes, he is a cutie! Thanks for stopping by. Thanks for the link…I had forgotten that song. Yes, dog lovers have much in common. Thanks! We dog owners do anything for our beloved pets, including writing poetry about them. Thanks!